After his many years as a typical bachelor cowboy, Slim Chance is convinced—against his will — that he needs to build his own herd of cattle and invest in the future. So, he takes the plunge, takes out a loan, and takes his newly-bought heifers to a pasture on Viola’s father’s ranch. But, just about the time his new herd is calved-out and his investment is beginning to look promising, the dry and windy weather conditions put the entire county on High Alert for fire-danger. 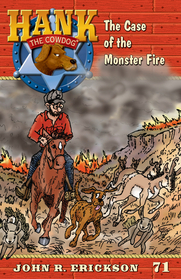 Hank is sure that he and Slim can defend the ranch against anything that comes their way, that is, until they come face-to-face with a wild fire unlike any grass fire they’ve seen before. Will Slim be able to get the cattle to safety in time? And, more importantly, what about Slim himself? You won’t want to miss this hair-raising and heart-warming tale of cowboy-bravery, true heroism, and the blessings of friends and community! Book 71 for the Kindle (Amazon) - Now Available! Book 71 for the iPad (iTunes) - Now Available!